Who’d a’ thunk it? No sooner have I mentioned Chutzpah’s continued love for Mert & Marcus’ photographic style and their numerous fashion campaigns in my Versace ad campaign blogpost than lo and behold!, Armani’s latest ad campaign by, you guessed it….Mert & Marcus, appears in my inbox. You’d almost think there was something kismet about it, wouldn’t you? (instead of PRs steely powers of observation and opportunity). Nevertheless, it’s a goodie and we’re loving the pared down yet sharp 1990s feel of these pics. The differences is, 2012 sees these two diametrically opposing style power houses linked by the love of the same photography duo. Just goes to show that the power of the 1990s and those big Italian houses never went out of style. They’ve just shifted the goalposts. Photographed by Mert Alas and Marcus Piggot under the creative direction of Giorgio Armani, the campaign features models Milou Van Groesen and Simon Nessman. The advertising campaign debuts around the world in fashion and lifestyle magazines starting in February issues (out mid-January). 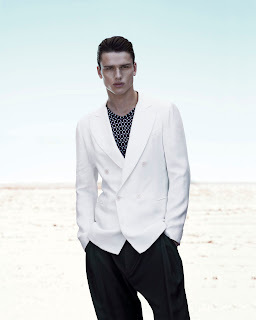 Those are pretty awesome but Emporio Armani SS12 is much cool taken in Hong Kong, you better see the photos of that.